Probably first commissioned by a knight of the St Omer family of Mulbarton, Norfolk, c.1325, this psalter was decorated in two campaigns about seventy years apart. The original artists finished the paintings but only part of the decoration. In the early 15th century another artist finished most of it, resulting in combinations of 14th- and 15th-century styles on some pages. The 14th-century artists had left drawings for some of the decoration, which the later artist followed. Where there were no pre-existing drawings, the 15th-century artist modified the general system of the earlier designs and painted single figures or plants in the areas where the earlier artist would have put diminutive story-telling scenes. 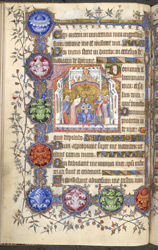 Humphrey, Duke of Gloucester, owned the manuscript in the 15th century and probably had the later work done. Modifying, updating or finishing a manuscript's decoration many years later was not at all uncommon at any period in the middle ages, rather like redecorating or remodelling a house. The 15th-century painter decorated Psalm 26 / 27 ("The Lord is my light") with a picture of the anointing and crowning of David, who was believed to have written the Book of Psalms. In the discs of the border, which follows the 14th-century artist's design, he painted over-sized blossoms, shaded in monochrome.